Restaurant Development & Design featured Serious Audio Video’s Casey S Johnston in an article about designing user-friendly restaurant AV that fits the aesthetic and enhances customer satisfaction. A restaurant’s audiovisual system’s ability to influence the dining atmosphere is undoubtedly a powerful factor. “AV systems are no longer thought of as vanity now but as a necessity,” says Casey Johnston, founder and lead designer of Serious Audio Video Inc. Proactive and upfront planning and coordination of the AV system is critical. 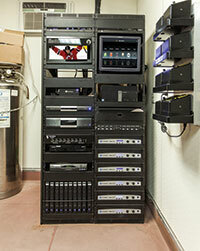 AV system design is a critical component in creating a positive guest experience. “It’s hard to believe, but there is a difference between 50 and 52 endpoints regarding the design, acoustics and ambience in the restaurant,” says Howell. The first decision to make is whether to go with a networked versus an analog system. “With a networked system, an owner can have a wider variety of audiovisual sources and, because this solution employs standard networking equipment for the distribution, it’s merely half the size of traditional AV racks,” says Andrade. Networked systems will use CAT5 or CAT6 shielded wiring, which takes up less space within the building and, most important, within the ceiling plenum space — a feature that is highly desirable in open-ceiling designs. Due to the fragility of CAT5 wiring, Johnston recommends adding 50 percent more wiring to allow for a double run to each endpoint. “Analog AV equipment technically has a more stable connection,” says Howell. “Even though analog is becoming outdated, the wiring is less expensive and more durable than CAT5 and CAT6.” Analog chassis come in increments of eight endpoints, which limits the flexibility of the overall system. If the restaurant would like to add a few more endpoints, it would need to purchase an additional chassis that has a minimum of eight more endpoints. Audiovisual controls range from very complex to the easy-to-use residential-style setups. 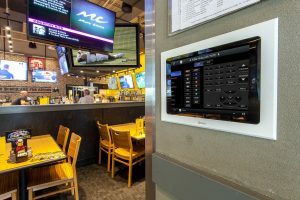 Photo by Anthony TorsielloJohnston’s company, located in New Jersey, has grown to depend on a networked, integrated AV system for restaurants. This approach tends to be more common in residential settings because it takes a more pre-programmed approach, using controls and equipment that are not quite as complex. Serious Audio Video started installing these low-tech solutions exclusively after Hurricane Sandy wiped out so many of the company’s clients’ AV systems. The more traditional type systems they had installed previously were shutting off from the storm’s power losses, and then Johnston would need to go back out to each location to reestablish each AV connection despite the fact that the systems did not suffer any other damages from the storms. However, the residential-type systems would come back online and reestablish wireless handshakes without Johnston’s intervention when the electricity came back on. When Johnston realized how resilient these systems were, he began to install them in all of his projects. Johnston goes on to say that they design the AV system to integrate with the lighting and the HVAC system and even to motorized drapery. So, the entire system can be turned off at the same time at the end of the day, can be controlled remotely and can even be programmed to automatically adjust throughout various dayparts, making the system incredibly easy for operators to control. AV equipment needs to be kept clean and properly ventilated. With the trend of moving back-of-the-house functions to the front, AV systems can even be designed to stay visible to patrons. “They like seeing the lights and technology,” says Howell. “Most often, we hang speakers from the ceiling to prevent hot spots,” says Howell. “The speakers are then supplemented with subwoofers to get an incredible sound.” Some restaurants are installing stealth speakers, which are background-only sound devices located inside the wall with a coat of drywall mud and paint over the top. Speakers can be hidden in myriad ways: behind artwork, behind acoustically transparent wall fabric, within ceiling tiles and even inside LED smart bulbs outfitted with Bluetooth. “Hiring an acoustician gets expensive,” says Howell. Acoustic treatments and sound-masking strategies can work together to prevent reverberation. Johnston recommends hiding foam anywhere possible within the restaurant. If the restaurant has an open-ceiling design, then an acoustics challenge exists. It is ideal to add battens to soften the sound; sometimes they hang from the plenum space. Supplemental speakers could emit noise-canceling and sound-masking properties. An acoustical engineer could be an invaluable asset to a restaurant that is particularly challenging. For example, some restaurant owners want outdoor music for their patios, but they are located in a sound-restricted zone. Acousticians can take the AV system design to a higher level for both the interior and exterior audiovisual systems.